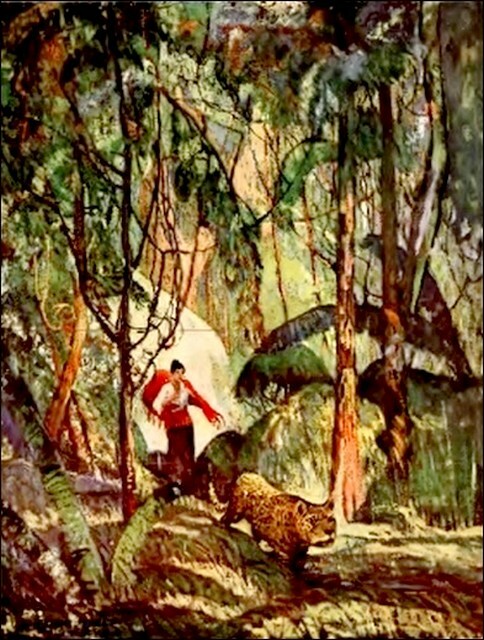 Tigre (found in Tappan’s Burro and Other Stories, 1923) was first published in Munsey’s Magazine in September of 1912. Tigre could be said to be both a love/revenge story and a tale of a man who liked to keep animals in slave-like conditions. We get to see just how complete Bernado’s control over Tigre was. Taumaulipas in Mexico is where the story states Bernado had “tamed” all of his animals. Today Taumaulipas is one of Mexico’s favored eco-tourism destinations (see video). “And that, seqor?” asked Muella. She tossed her small head, so that her black curls rippled in the sunlight, and the silver rings danced in her ears. Muella watched the lithe figure of a man striding swiftly along the trail. He was not going to drive cattle up to the corrals, for in that case he would have been riding a horse. He was not going toward the huts of the other herders. He faced the jungle into which ran the Micas trail. Surely he could not be on his way to Micas! The afternoon was far advanced and the village many miles away. No vaquero ever trusted himself to the dangers of the jungle at night. Even Augustine, the boldest and strongest of Bernardo’s many herders, would scarcely venture so much. Yet Augustine kept on down the trail, passed the thatched bamboo fence, went through the grove of palms, and disappeared in the green wall of jungle. She saw a dull red in her husband’s cheeks, a dark and sinister gleam in his eyes; and her surprise yielded to misgiving. “I say he loved you,” returned Bernardo hoarsely. Muella stood rigid in his grasp, her eyes blazing the truth that her lips scorned to speak. “I’ll make you tell!” he shouted, and ran to a cage of twisted vines and bamboo poles. As he fumbled with the fastening of a door, his brown hands shook. A loud purr, almost a cough, came from the cage; then an enormous jaguar stepped out into the sunlight. Tigre was of huge build, graceful in every powerful line of his yellow, black- spotted body, and beautiful. Still, he was terrible of aspect. His massive head swung lazily; his broad face had one set expression of brute ferocity. The eyes of any jaguar are large, yellow, cold, pale, cruel, but Tigre’s were frightful. Every instant they vibrated, coalesced, focused, yet seemed always to hold a luminous, far-seeing stare. It was as if Tigre was gazing beyond the jungle horizon to palm-leaf lairs which he had never seen, but which he knew by instinct. And then it was as if a film descended to hide their tawny depths. Tigre’s eyes changed—they were always changing, only there was not in them the life of vision; for the jaguar was blind. Bernardo burst into rapid speech. Bernardo clutched the fur of the great jaguar and leaned panting against the thatch wall of the cage. He led Tigre to the path and forced the nose of the beast down upon Augustine’s footmarks. Suddenly the jaguar lost all his lax grace. His long tail lashed from side to side. Then, with head low, he paced down the path’ He crossed the grassy plot, went through the fence, along the trail into the jungle. “He’s trailing Augustine!” cried Muella. She felt Bernardo’s gaze burning into her face. “Tigre will trail him—catch him—kill him!” her husband said. She eluded Bernardo’s fierce onslaught, and, fleet as a frightened deer, she sped down the path. She did not heed his hoarse cries, nor his heavy footsteps. Bernardo was lame. Muella had so little fear of his catching her that she did not look back. She passed the fence, sped through the grove, and entered the jungle. The trail was hard-packed earth, and ahead it lost its white line in the green walls. Muella ran swiftly, dodging the leaning branches, bowing her head under the streamers of moss, striking aside the slender palm leaves. Gay-plumaged birds flitted before her, and a gorgeous butterfly crossed her path. A parrot screeched over her head. She strained her gaze for the trailing jaguar. Then she saw him, a long black and yellow shape moving slowly under the hanging vines and creepers. When Muella caught up with Tigre, she slackened her pace, and watched for a wide place in the trail where she could pass without touching him. But still she did not take advantage of several wide places. Presently the trail opened into a little glade. Twice she started forward, only to hang back. Then desperately she went on, seeing nothing but the great spotted cat just in front of her. Twice she started forward, only to hang back. Sharp spear-point palm leaves stung her face, and their rustling increased her terror. She flashed by Tigre so close that she smelled him. Muella uttered a broken cry and began to run, as if indeed she were the wild creature Bernardo had called her. She looked over her shoulder to see the sinuous yellow form disappear round a bend of the trail. Then she gathered courage. For a long time her flying feet pattered lightly on the trail. She was young, supple, strong, and it took much to tire her. She ran on and on, until her feet were heavy, her breath was almost gone, and her side pierced by a sharp pain. Then she fell to a walk, caught her breath, and once more ran. Fears began to beset her. Had Augustine left the trail? How swiftly he had walked! It seemed as if she had run several miles. But that was well, for, the larger the distance the farther she would get ahead of the jaguar. Shadows began to gather under the overhanging vines and creepers. Only the tips of the giant ceibas showed a glint of sunlight. The day was fast closing. Once more she ran on and on; and then, as she turned a curve, a tall, dark form stood out of the green, and blurred the trail. “Augustine! Wait! Wait!” she cried. The man swung round, and ran back. Muella, panting for breath and with her hand pressed over her heart, met him. “Seqora! What has happened?” he exclaimed. Muella took a fleeting upward glance at him. It was so hurried that she could not be positive, but she thought she had caught a strange, paling flush of his bronzed face and a startled look of his dark eyes. Why should his meeting her unexpectedly cause more than surprise or concern? As she trotted along, she shot another quick glance up at him. He seemed unmistakably agitated; and this disconcerted her. She heard his amazed questions, but they were mostly unintelligible. She had thought of nothing save to catch up with him and to blurt out that Tigre was on his trail, and why. The words now halted on her lips. It was not easy to tell him. What would he say—what would he do? A few moments back, he had been only one of Bernardo’s herders—the best, truly, and a man whom it was pleasing to look upon, but he had been nothing to her. He alone of the vaqueros had not smiled at her, and this piquing of her pride had gained him notice which otherwise he might never have got. As she pattered on, slowly regaining her breath, the presence of the man seemed to grow more real. It was well that she knew Augustine cared nothing for her, else she could not have told him of Bernardo’s unjust suspicions. The trail opened into a clearing, where there were several old palm-thatched huts, a broken-down corral, and a water hole. The place had once been used by Bernardo’s herders, but was now abandoned and partly overgrown. At this point, Augustine, who for a time had silently stalked beside Muella, abruptly halted her. With one long stride Augustine barred the trail and stood over her. Muella’s eyes dilated and darkened with shadows of amaze, wonder, and pain. With a passionate gesture Augustine stopped her. Augustine whispered the name of a saint, and turning his dark face toward where the trail led out of the clearing, he strode on without sheathing his machete. Muella kept close to him, and entered the enclosing walls of jungle verdure. She felt indeed that she was the untamed thing Bernardo had called her, and now she was hunted. Light as dropping leaves, her feet pattered in the trail. Augustine loomed beside her, striding swiftly, and now and then the naked blade he carried, striking against a twig or branch, broke the silence with a faint ring. The green walls became hovering shadows and turned to gray. Muella had an irresistible desire to look back. The darkening menace of the gloom before and on each side was nothing to that known peril behind. She saw nothing, however, but a dull, gray, wavering line fading into the obscurity of the jungle. She strained her hearing. Except for the soft swishing of her skirt on the brush, and the occasional low ring of Augustine’s machete, there was absolutely no sound. She noted that her companion never turned his head. Had he no fear? Quick flashes of memory recalled stories of this herder’s daring. How tall and powerful he was—how swiftly he strode—how dark and stern and silent he seemed! He must know full well the nature of Bernardo’s pet, the terrible blind brute that never failed on a trail. All at once the jungle grew into two ragged walls of black separated by a narrow strip of paler shade. Night had fallen; and with it came a blinking of stars through dense foliage overhead, and the lighting of fireflies. Insects began to hum. Rustlings in the brush augmented Muella’s sensitiveness. A strange call of a night bird startled her, and instinctively she shrank closer to Augustine. She wished to speak to him, to make the silence bearable; but stealthy steps off to the right made her heart leap and her tongue mute. Augustine heard, for he struck the leaves with his machete. From the enshrouding blackness came the snapping of twigs, pattering little steps, the rush of animals running through grass or ferns, and soft rustlings in the brush. Then the night silence awoke to strange cries—squall of cat and scream of panther, squeaks and grunts and squeals of peccaries, and inexpressibly wild sounds, too remote to distinguish. She fancied she saw him reach out as if to help her, and then draw suddenly back. The darkness became so thick that she could scarcely see him. Like a tall specter he moved on. She groped for his arm, found it, and slipped her hand down to his. Instantly she felt his strong fingers convulsively close round hers. The warm clasp helped and cheered her. So, mile after mile, Muella kept tireless pace with the herder; and when the jungle creatures ceased their hue and quest, and the dead silence once more settled thickly down, the strange night flight lost its reality and seemed a dream. The black shadows lifted and paled to opaque gloom. A whiteness stole into the jungle; silver shafts gleamed through the trees. The moon was rising. Muella hailed it with joy, for it meant that the night was far advanced, and that their way would be lightened. Soon all about her was a radiant, encompassing world of silver shadows and gleams. It was a beautiful night. The cold fear weighting her heart lessened, seemed momentarily to be thrilled and warmed away. She loved that great, silver- orbed, golden-circled moon; and now she looked up at it through a streaked and fringed and laced web. She wondered if Augustine saw the beauty of the sharp-cut palms, the delicate- leaved bamboos, and the full-foliaged ceibas, all festooned with long silver streamers of moss. Gnarled branches of a dead monarch of the forest, silhouetted against the deep blue of the sky, showed orchids and aloes and long, strangling vines—parasites that had killed it. Every unshadowed leaf along the trail glistened white with dew. The glamor of the white night was upon Muella. Augustine’s voice broke the spell. His words and the glint of his naked machete brought her back to actuality. She slipped her hand from his. Slowly a haze overspread the moon. The brightness failed, and then the moonlit patches imperceptibly merged into the shadows, until all was gray. The jungle trees rose dim and weird and lost their tips in clouds of mist. A chicolocki burst into song, and the broken notes heralded the coming of day. The herder mumbled a reply that she did not understand. Swiftly upon the gray dawn came the broad daylight. The clouds of creamy mist rose and broke and rolled away, letting the sunshine down into the jungle. The balmy air rang with the melodies of birds. Flocks of parrots passed overhead, screeching discordant clamor. Presently it struck Muella that the trail was growing narrow and rough and overgrown. She had journeyed to Micas often enough to be familiar with the trail, and this, so wild and crooked, was not the right one. “Augustine, have you missed the way?” she queried anxiously. Briefly he replied that he was making a short cut. Muella did not believe him. She walked on, and began again to look back. When she caught Augustine doing likewise, she gave way to dread. The morning wore on, the sun grew warm, and with the heat of day came the jungle flies and mosquitoes. Augustine was inured to their attacks, but Muella impatiently fought them, thus adding to her loss of energy. When, at the crossing of a network of trails, Augustine chose one at random, Muella was certain of the worst. She asked him about it, and he admitted he was off the course, but as he was sure of his direction there was no need of fear. He assured her that he would have her at her sister’s home in Micas by noon. Noon found them threading a matted jungle where they had to bend low along the deer and peccary trails. The character of the vegetation had changed. It was now dry, thorny, and almost impenetrable. Suddenly Muella jerked her hand away from a swinging branch, which she had intended to brush aside. Her hand and wrist were dotted with great black jungle ticks. Augustine removed them, and as he did so, Muella saw his fingers tremble. The significance of his agitation did not dawn upon her until she was free of the pests, and then she fancied that her touch had so moved him. It was wonderful, it warmed her blood, and she stole a glance at him. But Augustine was ashen pale; his thoughts were far from the softness and beauty of a woman’s hand. “Augustine! You have lost your way!” she cried. Gloomily he dropped his head, and let his silence answer. “Lost in the jungle! We’re lost! And Tigre is on our trail!” she shrieked. Panic overcame her. She tottered and fell against him. Her whole slender length rippled in a violent trembling. Then she beat her hands frantically on Augustine’s shoulders, and clutched him tight, and besought him with inarticulate speech. “Go on alone! And you?” she said brokenly. “You think that if you took me to Micas the old women would talk—that my good name would be gone?” she asked searchingly. “Seqora, we waste time, and time is precious,” he protested. Muella studied the haggard, set face. This man meant to sacrifice his life for her. Deep through the fire of his eyes she saw unutterable pain and passion. If she had doubted his love, she doubted no more. He must be made to believe that she had followed him, not alone to save him from Tigre, but because she loved him. Afterward he would be grateful for her deceit. And if her avowal did not break his will, then she would use a woman’s charm, a woman’s sweetness. “Seqor, you told Bernardo the truth—and I lied to him!” she said. Stranger than all other sensations of that flight was the thrill in her as she forced herself to speak. “What do you mean?” demanded Augustine. “Augustine, wait, wait!” she cried. Running blindly, she flung herself into his arms. She hid her face in his breast, and pressed all her slender, palpitating body close to his. As if he had been turned to stone, he stood motionless. She twined her arms about him, and her disheveled hair brushed his lips. She tried to raise her face—failed—tried again, and raised it all scarlet, with eyes close shut and tears wet on her cheeks. Blindly she sought his mouth with her lips—kissed him timidly—tremulously—and then passionately. With that, uttering a little gasp, she swayed away and turned from him, her head bowed in shame, one beseeching hand held backward to him. Presently he took the proffered hand, and, leading her, once more plunged into the narrow trail. For hours Muella walked with lowered eyes. She plodded on, bending her head under the branches, and constantly using her free hand to fight the pests. Her consciousness, for the while, was almost wholly absorbed with a feeling of an indefinable difference in herself. She seemed to be in a condition of trembling change, as if the fibers of her soul were being unknit and rewoven. Something illusive and strange and sweet wavered before her—a promise of joy that held vague portent of pain. This inexplicable feeling reminded her of fancies, longings, dreams of her girlhood. At length sensations from without claimed full share of Muella’s attention. The heat had grown intense. She was becoming exhausted. Her body burned, and about her ankles were bands of red-hot fire. Still she toiled on, because she believed that Micas was close at hand. The sun went down, and night approached. There was no sign of water. Augustine failed to hide his distress. He was hopelessly lost in the jungle. All the trails appeared to lead into the same place—a changeless yellow and gray jungle. The flies pursued in humming wheel, and clouds of whining mosquitoes rose from the ground. The under side of every leaf, when brushed upward, showed a red spot which instantly disintegrated, and spilled itself like a bursting splotch of quicksilver upon the travelers. And every infinitesimal red pin point was a crawling jungle pest. The dead wood and dry branches were black with innumerable garapatas. Muella had been born a hill native, and she was not bred to withstand the savage attack of the jungle vermin. The time came when she fell, and implored Augustine to put her out of her misery with his machete. For answer he lifted her gently and moved on, carrying her in his arms. Night came. Augustine traveled by the stars, and tried to find trails that led him in a general direction northward. By and by Muella’s head rolled heavily, and she slept. At length the blackness and impenetrable thicket hindered his progress. He laid Muella down, covered her with his blanket, and stood over her with drawn machete till the moon rose. The light aiding him, he found a trail, and, taking up his burden, he went on. And that night dragged to dawn. Muella walked little the next day. She could hardly stand. She had scarcely strength to free her hair from the brush as it caught in passing. The burning pain of her skin had given place to a dull ache. She felt fever stealing into her blood. Augustine wandered on, over bare rocks and through dense jungles, with Muella in his arms. He was tireless, dauntless, wonderful in his grim determination to save her. Worn as she was, sick and feverish, she yet had moments when she thought of him; and at each succeeding thought he seemed to grow in her impression of strength and courage. But most of her thoughts centered on the trailing Tigre. The serpents and panthers and peccaries no longer caused Muella concern; she feared only the surely gaining jaguar. Night closed down on them among tangled mats and labyrinthine webs of heavy underbrush. “Listen!” whispered Muella suddenly, with great black eyes staring out of her white face. From far off in the jungle came a sound that was like a cough and growl in one. Again the sound broke on the still night air. Muella slipped to the ground with a little gasp. She heard Augustine cursing against the fate that had driven them for days under trees, trees, trees, and had finally brought them to bay in a corner where there was no tree to climb. She saw him face about to the trail by which they had come; and stand there with his naked blade upraised. He blocked the dim, narrow passageway. An interminable moment passed. Muella stopped breathing, tried to still the beating of her heart so that she could listen. There was no sound save the low, sad hum of insects and the rustle of wind in leaves. She seemed to feel Tigre’s presence out there in the blackness. Dark as it was, she imagined she saw him stealing closer, his massive head low, his blind eyes flaring, his huge paws reaching out. A slight rustling checked all motion of her blood. Tigre was there, ready to spring upon Augustine. Muella tried to warn him, but her lips were dry and dumb. Had he lost his own sense of hearing? Her head reeled and her sight darkened; but she could not swoon. She could only wait, wait, while the slow moments wore on. Augustine loomed over the trail, a dark, menacing figure. Again there came a rustling and a stealthy step, this time in another direction; and Augustine turned toward it. Long silence followed; even the humming of insects and the moaning of the wind seemed to grow fainter. Then came more tickings of the brush and a padded footfall. Tigre had found them—was stalking them! Muella lay there, helplessly waiting. In the poignancy of her fear far Augustine, expecting momentarily to see the huge jaguar leap upon him, she forgot herself. There was more in her agony of dread than the sheer primitive shrinking of the flesh, the woman’s horror of seeing death inflicted. Through that terrible age-long flight through the jungle, Augustine had come to mean more than a protector to her. She watched him guardedly facing in the direction of every soft rustle in the brush. He was a man at the end of his resources, ready to fight and die for a woman. The insects hummed on, the wind moaned in the leaves, the rustlings came from one point and another in the brush, but Tigre did not appear. The black night lightened and the moon rose. Muella now distinctly saw Augustine—disheveled and ragged, white and stern and wild, with his curved blade bright in the moonlight. Then the gray mist crept up to obscure the white stars and the moon, and at last the blue vault. The rustlings ceased to sound in the brush. From far off rasped the cough of a tigre. It appeared to come from the same place as when first heard. Hope had new birth in Muella’s heart. Moments like hours passed; the insects ceased to hum and the wind to moan. The gray shadows fled before a rosy dawn. Augustine hewed a lane through the dense thicket that had stopped him, and presently he came upon a trail. He hurried back to Muella with words of cheer. Strength born of hope returned to her, and she essayed to get up. Helping her to her feet, he half led and half carried her into the trail. They went on for a hundred paces, to find that the path suddenly opened into a wide clearing. To Muella it had a familiar look, and Augustine’s exclamation assured her that he had seen the place before. Then she recognized a ruined corral, some old palm-thatched huts, and a water hole as belonging to the clearing through which they had long before passed. Muella leaned against him and wept. First of all was the joy of deliverance. From the center of the clearing came a rustling of dry leaves, then a loud purr, almost a cough. Augustine stiffened, and Muella clutched frantically at him. For a long moment they stood, dark eyes staring into dark eyes, waiting, listening. Then Augustine, releasing his hold on the trembling girl, cautiously stepped upon a log and peered over the low palms. Almost instantly he plunged down with arms uplifted. But as he crept under the low palms she followed him. They came to the open clearing. Tigre lay across the trail, his beautiful yellow and black body stretched in lax grace, his terrible sightless eyes riveted on a dead man beside him. “Muella—stay back—I fear—I fear!” said Augustine. He crept yet a little farther, and returned with pale face and quivering jaw.